Falling prices for lithium-ion batteries will make power-storage systems competitive with natural gas as a source of electricity during periods of high demand by 2016, according to the chief executive officer of A123 Systems Inc.
“In general, batteries will come down by about half in price from 2010 to 2015,” David Vieau said yesterday in a telephone interview. Waltham, Massachusetts-based A123 has shipped more than 90 megawatts of battery systems that utilities use instead of gas-fired peaker plants. Utilities currently use gas-fired plants to supply power to meet short periods of peak demand, sometimes only a few hours a year. 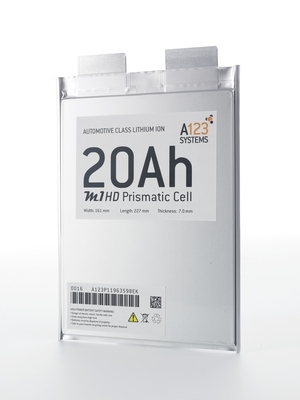 A123 makes battery systems that store power and supply it when needed. Improvements in battery chemistry and manufacturing will drive down prices and make them last longer, making them a viable replacement for gas, Vieau said. “The challenge is to demonstrate that they last 10 to 20 years,” making them comparable with existing power-generation plants, he said. Utilities owned by AES Corp, Sempra Energy and Edison International use A123’s storage systems, which provide within milliseconds anywhere from 10 kilowatts to 500 megawatts of power, for as long as eight hours. Sales of grid-power systems made up 32 percent of A123’s third-quarter revenue. Its transport business, including batteries for electric cars, buses and commercial vehicles, made up 54 percent. The grid business now makes up 40 percent to 50 percent of A123’s sales, Vieau said. “The company has focused a lot on grid and commercial businesses and yet we are labeled as an electric-vehicle company.” The company supplies batteries to General Motors Co. and Daimler AG. The company had $97.3 million in revenue in 2010. Analysts expect 2011 revenue to reach $167.7, the average of 11 estimates compiled by Bloomberg.